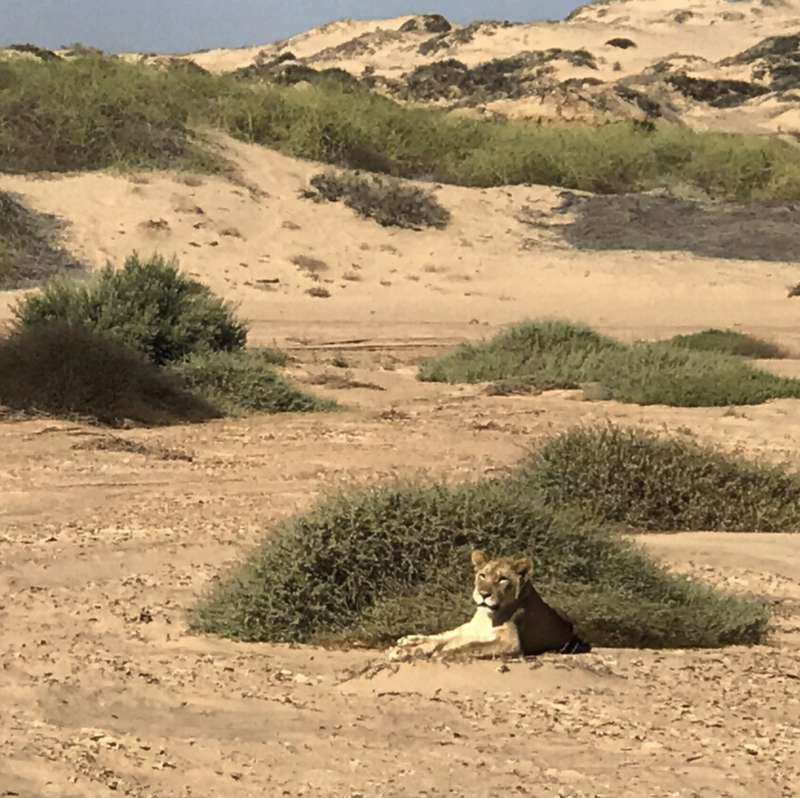 We heard about a small group of desert-adapted lions in Namibia located in the northwest corner of the country, in a desert area around the Skeleton Coast. These unique lions were made famous in a recent documentary called the Vanishing Kings, and had a fierce protector in a researcher and conservationist, Dr. Philip Stander. The desert-adapted lions are only location in this small remote area of Namibia and number approximately 150 in total. These lions are different when compared to other lions because of their special adaptions and habits. Their legs are longer than typical African lions to adapt to walking across hot sand dunes, but their coats are thicker because of the cold desert nights. To cool down during hot days, they can sweat through their paw pads and pant. They can go longer periods without water and can get some of their hydration needs from the blood of their prey. They are also different in the way that they hunt. In the desert prey is scarce and the the lions have to travel long distances to find food. They are willing to hunt smaller prey, like field mice, which other lions wouldn’t waste energy hunting. 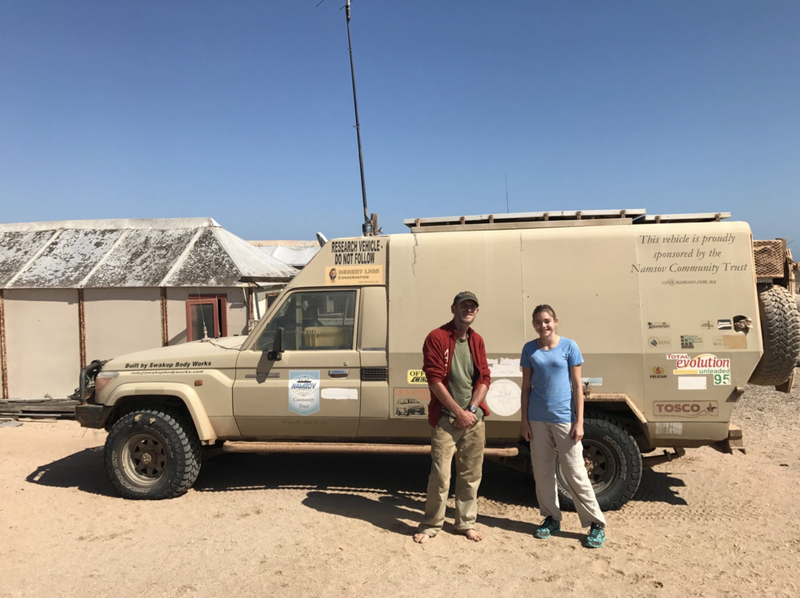 We had special access to the protected Skeleton Coast National Park where we were going to start looking for the lions thanks to Wilderness Safaris. Our guide, Elias, met us at Hoanib Camp and drove us out. There are several groups of lions in the area that are well known to the guides. The most famous were the five Musketeers, five brothers which were featured in the documentary Vanishing Kings, sadly only one of them survives today. There are also the three sisters, and their aunt. There is a group of two sisters and a brother. Elias, warned us about the high chances of not seeing any lions. Recently there had been several incidents of farmers killings lions. 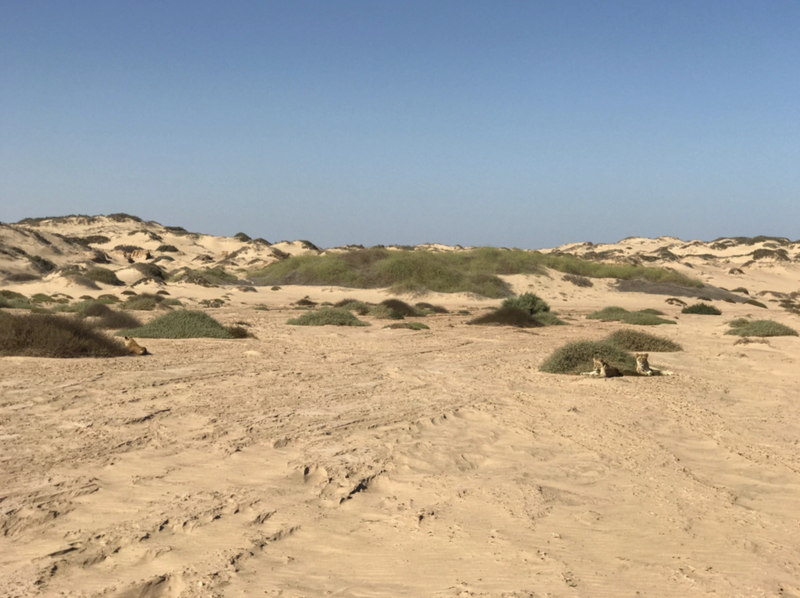 Human wildlife conflict is one of the biggest problems for all African wildlife conservation and desert adapted lions are no exception. When predators wander into the herder’s land for an easy meal, usually a cow or goat, they become the enemy. Lions, cheetahs, leopards, hyenas, and even jackals are shot, trapped, or poisoned to save the herder’s livestock. We drove several hours into the sand dunes towards a special oasis where the group of young lionesses, the three sisters, like to hang out. Elias hoped we could spot them there. We looked around and didn’t see them. We talked about how it was okay that we couldn’t find them, because of course their territory was large, and they were so few. It would be more unusual if we were lucky enough to see them in only a few hours on our first day. We were going to meet with Dr. Philip at his basecamp on the Skeleton Coast so we were okay with not seeing the lions. I was disappointed, but hopeful that maybe we would see them elsewhere. I put on my lions ears for the rest of the drive and for goodluck just in case. We left the oasis lions ears firmly attached, talking about interview questions with my mum. Elias’ radio started chattering, one of the other guides had found the three sisters just on the other side of the dunes, and we were only 2 minutes from them. Elias got all giddy, he hadn’t seen the lions in ages, and decided that my lion ears had brought us good luck! We pulled up slowly and as quietly as a jeep can behind the other vehicle and there they were! Three lions, sleeping ten feet away from us! One of them was in the shade, while the other two were directly in from of us in the sun. The three sisters used to be a family of four sisters and their mother. During a flash flood when they were small, their mother had to move them to higher ground one by one and the fourth cub didn’t make it, no one knows what happened. When the sisters were a year old, their mother got in a fight with a leopard and died, leaving them too young to survive. They learned to hunt on their own, surviving mostly on field mice. Now they are healthy looking two year-old lionesses. We watched them for twenty minutes, until the two in the sunshine yawned, stretched and walked over to the shade. Then we slowly drove away and headed to the coast to meet with Dr. Philip. When we got there, his research truck was parked outside a little cabin on the beach near the ranger station. He was barefoot, sitting at his desk, writing. 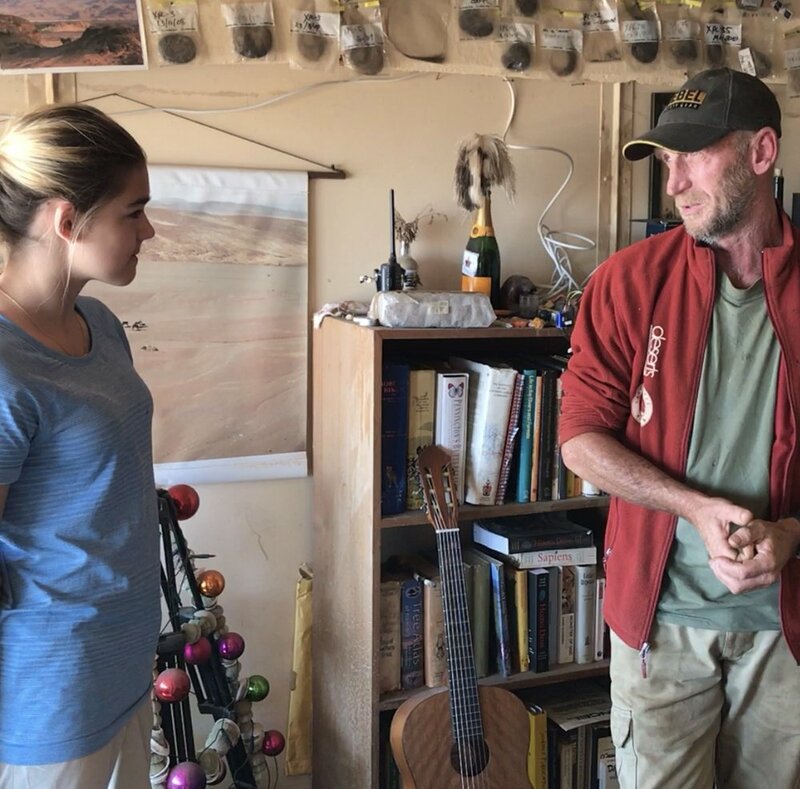 We were lucky to meet with him, because he is usually in the field somewhere in his truck for weeks at a time. Sleeping, eating, and working out of the truck as home, office, and research station all in one. At Desert Rhino Camp we had heard a rumor about him writing on his body when he ran out of paper. If you want privacy, working in a national park that doesn’t allow visitors is a good place to be based. Dr. Philip talked about his background studying the lions for the past 20 years. Growing up on a farm in Namibia, his earliest memories were of animals. He doesn’t remember what got him interested in studying animals. He studied zoology and got his PhD in evolutionary biology. “Lions are under threat because they threaten people”. The local people don’t typically like the lions, they are often afraid of them. This is why the farmers are the greatest threat in the area, especially lately, poisoning several lions and shooting them. Right now he has 27 lions with radio collars. The collars only last about a year or year and a half, but they give vital data for his work understanding how to protect the lions. What do lions need? Space. Land and space is the critical thing for all wildlife. Humans have taken the space away for animals. We need to create space. Boundary problems are the issue – where animals and human meet. Namibia has certain rules set up to help protect these boundary areas. One solution for the human animal conflict specific to desert adapted lions is making livestock corrals required and setting up trained patrols when lions are spotted in the area. Does conservation in Namibia work? Namibia has been recognized internationally for its conservation work. Involving the local communities in conservation has been a really good step. Tourism brings a lot of income into the country and helps to filter down into the communities. Like many people have told us, it could work better, but its a start. Conservancies and national parks working together are helping to protect wildlife and reduce human animal conflicts.